There is a lot of history concentrated in the new trio led by longtime ECM stalwart Jack DeJohnette. Fifty years ago, as a young drummer sitting in with John Coltrane’s group, he played with the fathers of both Ravi Coltrane and Matthew Garrison. Ravi, an accomplished saxophonist in his own right nowadays, not only had an iconic father but also the questing keyboardist-harpist Alice Coltrane as his mother. Matthew, bassist and electronic experimentalist, is the son of Jimmy Garrison, the bassist of the classic Coltrane quartet. 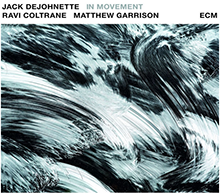 For In Movement, their first album together, DeJohnette, Coltrane and Garrison touch upon multiple legacies, starting with that of John Coltrane. New Album out now.